CBD products that come from Whole or Full Plant Hemp Extracts containing many naturally occurring Cannabinoids, Terpenes & Flavonoids and are organically grown, have been found to be higher quality with greater efficiency and effects. Love this product compared to others I tried. Keep up the good work the taste is tolerable compare to the last one I had took. Hello what strengths do you have in CBD oil? Cost ? The strengths vary from 250 thru 3000 mg. The 250mg price is $34.50 but if you are a Senior or a Vet you get an additional 10% off that price. 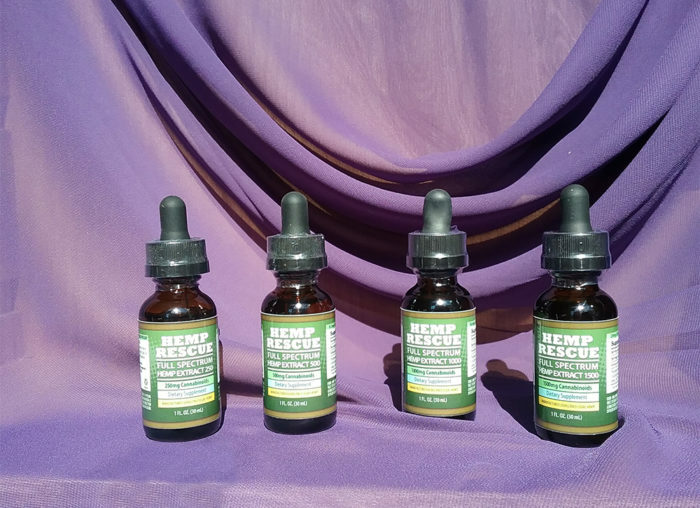 Hemp rescue CBD oil has been life changing. The full spectrum is pure and best CBD I’ve ever tried! Dennis P. Helps me greatly through my Parkinson! Hi Dennis – I just started using this for my Mom who has Huntington’s. Curious about your experience. So far, we have noticed about a 50% decrease in her chorea related movements. Some cognitive improvements, some compulsive behaviors have been reduced, and some of her good days are better in terms of communication. Using 15 drops 3 x a day. I am an allergy sufferer. I have anxiety and bi-polar disorder. I am lactose intolerant and have been diagnosed with Gerd. I am also an epileptic. I used to spend a couple hundred dollars on medication every month. Medications that come with horrible side effects. Now I buy this tiny bottle of CBD oil and don’t have to suffer through the side effects. I can eat ice cream again. I can go outside without my nose instantly swelling shut due to pollen. I can take my kids to the park and not have to worry about my medications causing me to become dizzy after half an hour of sun exposure. I can talk to people in the story without having a panic attack. I would absolutely recommend this for anybody and everybody. I don’t have the words to express the kinds of positive changes I’ve seen in myself. All of this without a prescription and without harmful medications. I have torn discs and arthritis in back, along with herniated discs and also my shoulder is torn and has degenerative disease in both, this product works so great for my pain and also lets me sleep thru the night it is so the best product I have used and I have been pill free for years as they are too addictive and got me hooked, where this is not and so beneficial, I recommend this to any pain sufferer!!! I just started using this for my Mom who elderly and has Huntington’s Disease. So far, we have noticed about a 50% decrease in her chorea related movements. Some minor cognitive improvements, some compulsive behaviors have been reduced, and some of her good days are better in terms of communication. Using 15 drops 3 x a day. Anyone else out there using for HD? I have been on so many different medications all my life, along with terrible side effects. The CBD oil helps me better without any problems. I plan to work my way off of the medications that cause more of my problems by taking the cbd oil instead. I recommend the oil to anyone that can benefit from its use. I’ve been going to House of Nutrition since I moved to Kenosha in early 2000s and most recently attended a CBD seminar. I was pleased to find out that House of Nutrition was involved, as Hemp Rescue. They gave a 1000mg sample at seminar and was pleased with earthy taste. I asked questions about ingredients, and was happy to find out that nothing is added to CBD oils except a small percentage of coconut oil. Pure. 1 serving of 1000mg is considered 15 drops. I’d say this is a good amount for me to experience effects. It helps keep my mind super concentrated, as I work on art all day. I tried two servings (30 drops) once and fell asleep from being drowsy. This stuff ain’t weak! Competitively priced for being as pure as it is. Some other CBD oils on the market are junk and have additives and flavors added, which reduces room in the bottle for the good stuff! Buy this product. It’s healthy. My husband jumped in our pool and broke his neck and lower spine in 08. He has been on numerous medication for the pain and to no avail nothing has helped .he sick of being on narcotics so he wanted to try the oil. And what a change in him ,he is much more relaxed and not in half the pain as before he is more pleasant to be around and more engaged in our childrens activities. There is no price you can put on the quality of life it (the oils) has given back to our family. I heard about CBD oil from a friend of mine. In researching, I found hemp rescue was the purest. I found it at House of Nutrition in Kenosha. The staff was so helpful and informative. I have been taking CBD for 45 days. I feel really good. I have more energy and my arthritis is manageable. I went in for a new supply and staff introduced me to Curamin to also help with arthritis. They are both now part of my regimen.